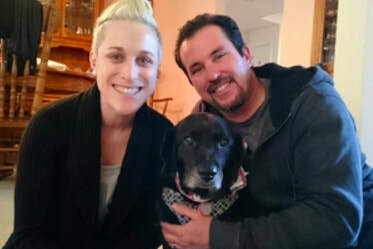 Rosie and her new parents, Briana and Mike, first came to see me at A Well Adjusted Pet for an urgent Behavior Consultation, a few weeks after her adoption from Muttville Senior Dog Rescue. Rosie had a rough start, rescued with a broken hip and severe skin disease from the streets of Tijuana. Her story is quite amazing. Although her hip had surgery and her skin and overall health had improved since her rescue, her behavior was only getting worse since her adoption. Rosie had been snapping at people and was afraid and unwilling to walk on a leash outside. She was recovering from bladder and dental infections, as well as a surgery to repair an inguinal hernia just a few weeks prior. "The snapping has been a problem since intake at Muttville, and the leash problems have progressed in the last couple of weeks. She snapped at the vet a couple days ago when he lifted her tail. Every time I take her outside she won't walk. Previously she snapped at a neighbor reaching to pet her. I saw her snap at the vet after surgery when she put her hand near Rosie's incision." Unfortunately, Rosie was also now snapping at her new mom and dad when they tried to handle her hip or tail area. Briana was concerned about feeding and walking her, as well. In Briana's words at the time, "She won't eat dog food. If I try to mix it in she spits it out and picks through it. She is terrible on the leash, she won't move. It is getting worse by the day. She seems very withdrawn and doesn't seem to want to play with toys or take treats." During her physical exam I found Rosie to have weakness and pain in her left hip and rear leg. She was clearly in pain and sensitive to handling, even while on her current pain medication. A few months before her transport to Muttville, Rosie had an FHO Surgery (Femoral Head Ostectomy), where the femoral head was cut off and removed, allowing the joint to heal as a false joint (just a capsule connecting the two bones but no actual bone to bone contact). If the pet is not carrying too much weight, a false joint is strong enough. If the dog is very active, a false joint will form quickly. However, Rosie was not active, and she had not had the opportunity for Physical Rehabilitation after surgery. At this point she should have been using her left rear leg nearly normally. Rosie did really well in the underwater treadmill and allowed some gentle massage and stretching of her tight hip flexors on that injured leg. We made a plan to avoid reaching over her head to allow her time to start to feel safe after all of her transitions and changes, and to start to build trust in the new people in her life. Rosie's story really shows the link between the mind and the body; in this case Rosie's fear and pain were both treated by playing games and by doing senior dog exercises or "pup-lates"! She now walks well on a leash, eats a well balanced, home prepared diet, and plays with her puzzles. She has become a much more "Well Adjusted Pet" ! “My husband and I adopted Rosie on October 24th, 2015 from Muttville. We had seen her on Muttville’s website and thought she was adorable. We knew we had to have her. We were told that she was being treated for a bladder infection and would need to be on daily pain medication to manage what is suspected as being hit by a car previously. Muttville had scheduled for her to have a huge hernia removed and her dental done and covered those appointments to help get her on track. When we brought her home, an outpouring of people reached out to us thanking us for taking her and sharing her story with us. Rosie had a huge story that we could have never imagined. She was spotted in an alley in a bad part of Tijuana starving and covered in mange. Sherri Stankewitz of West Coast Animal Rescue in Long Beach California saved her making arrangements to get her treatment and start her recovery here in California. Sherri and all of the amazing volunteers nursed her back to health. People sent us so many pictures of her life and recovery down in Long Beach California. It was amazing to see her progress and how many people knew her and cared for her. She remained at West Coast Animal Rescue for over two and half years. We had no idea why she had been transferred to San Francisco until someone sent us information that she had been in a show called Prank it Forward. It is a show that combines pranking someone and ultimately leads to paying it forward. The show ultimately surprised Sherri Stankewitz with help for her and adopters for all her dogs at an adoption event. The three senior dogs were brought up to San Francisco by Muttville to rehome, and we were over joyed to give one of them a forever home. Our journey with Rosie has been epic and we have had her just three months. We have dealt with many medical issues surrounding her mobility, surgeries and chronic bladder and ear infections. We also had a challenge getting her to trust people and getting her comfortable with socialization as we suspect this is her first time living in a home. Muttville assisted in getting us an appointment with Dr. Ilana Strubel who taught us so many ways that we could help make progress with Rosie. She helped us work with Rosie’s shyness and showed us great ways to build her confidence with dog puzzles. We learned how to help her with stretches and exercises to help her with her arthritis and previous injuries. We are also bringing her to The Rex Center for treadmill water therapy. She is getting better every day and we love seeing her blossom.